- La Tradition (no need to translate) is about French classic dishes, elevated. - La Saison (The Season), this time Summer, seasonal and local produces. - Le Potager (The Garden), vegetarian dishes. - Le Voyage explores cuisines of the world with a French twist. This time it was Mexican as it was the first voyage celebrated 20 years ago when the restaurant opened. They also had a special menu for La fête de Bayonne, to celebrate basque cuisine, but it is for all the table and, as Jodi is vegetarian, we dismissed it, most of the dishes being non-vegetarian. And to continue on the celebration theme, they had a live band that payed some nice music, not too loud, allowing us to have some conversation without having to shout. I should also mention their beverage list: lots of wine and interesting cocktails, and, to my delight, a nice selection of whisky, where the only complaint I have is the limited choices when it comes to a French whisky. I know that some may be surprised by this comment, but France has quite an extensive production of whisky, being a large cereal producer, and what great ambassador than a such an acclaimed Chef! The one I chose was a Rozelieures single malt smoked, that was indeed smokey like I like them, but less than an Ardberg Scotch. I liked it and would love to find a bottle (the search is on). 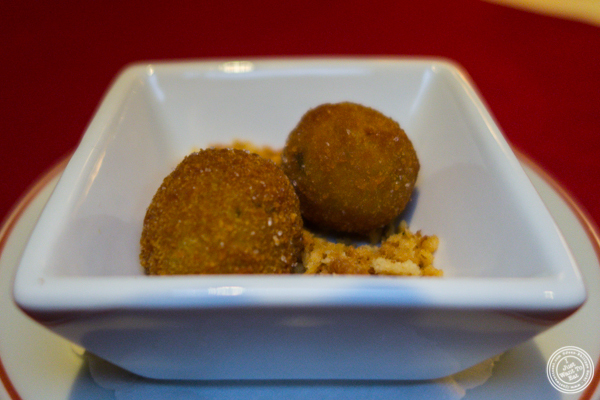 They started by bringing us an amuse: arancini with green peas and mozzarella. Delicious start for sure. As an appetizer, Jodi ordered the tomato salad made with Eckerton Hill Farm tomatoes, robiola nonno (a soft and creamy cheese), sourdough, basil pesto and cherry vinegar. On my side, I chose the seared foie gras that was served on top of a brioche doughnut with apricot, almond streusel and ginger. I loved it: the foie was delightfully fatty, melting in my mouth. I loved the brioche doughnut that is a nice touch, different from the usual brioche and with a more dense texture that is perfect with the foie, and the apricot that added some sweetness to the dish. For her entree, Jodi tried their sweet corn risotto, made with chanterelles mushrooms, Pecorino Romano, tarragon and vanilla oil. I thought it was a great idea to propose an appetizer size for it especially considering that Jodi has a small appetite...not like me! The risotto was succulent: creamy, the rice had a nice bite and I loved the wonderful sweetness from the corn. For me, it was simple: although I hesitated between the lamb and the duck, I decided to make it an all duck meal (except dessert of course). So I went for the Crescent Farm duck, served with peach, natural jus and some white grits and pecan crumb. There was a nice amount of duck that was perfectly cooked medium, not dry and with a skin that was deliciously fatty and very slightly crispy. I loved it. The grits were a tiny portion but they were so good I could have eaten more, even if I started to be full and really wanted to have dessert. And so yes, we got dessert and what a way to finish this superb meal! It was the molten chocolate cake weigh vanilla ice cream. That cake was one of the best I had: the center was, as expected, liquid. I hate when you ask for a molten cake and it is overcooked. Not at Café Boulud and we were in heaven. If you love chocolate, do not miss it. After all of this and as we were waiting for the check, they brought us some raspberry chocolates, as well as the same madeleines they served us at Daniel. This was a challenge to my full stomach because I could not stop eating them: they are so good! 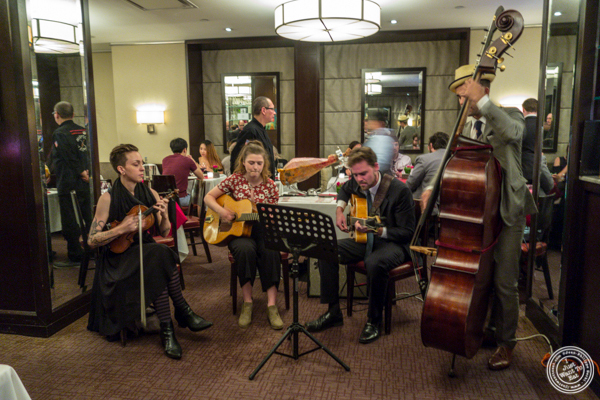 Our dinner at Café Boulud was great: the food was good and I liked the atmosphere with the band. I think it is very smart from them to have a menu that is not just French classics, and offers options like Le Voyage, ensuring that people come back from time to time to check out the creativity of the Chef. Chapeau Chef Boulud!